As a young physical education teacher I have observed many other physical education settings where team sports, individual skill evaluations, and fitness testing have prioritized over student individualization related to fitness for life. I continued to ask myself, "how do I make physical education a welcoming, challenging, and individualized experience for every student in class?" Truth was, I could not to my full potential, because I was lacking real student data. I would challenge myself to give real feedback to kids instead of saying "good work", or "keep it up". I did not know exactly how hard a student was working, it was an assumed observation. In 2014 our physical education program at Lincoln High School worked hard to get a grant through Medtronic to fund 60 wrist worn heart rate monitors through the Heart Zones company. Ever since we started teaching with heart rate monitors in PE it has been a complete game changer by leveling the playing field for all students and observing an increase in motivation and self awareness from students. There are a few different ways that Heart Rate Monitors function. The more traditional way is through a transmitter belt worn around your chest. Most of these belts use built-in microprocessors that analyze the EKG signal to determine heart rate. Newer technology that doesn't require a transmitter belt operate off of touch sensors within the armbands technology. These sensors pick up your HR and relay the data to a smart device. At the school I teach at, we use the armband monitors. Safety. The heart rate is a gauge by which to assess the intensity of your workout to make sure you’re not overexerting or overextending yourself. For example, if your heart rate is above your working heart rate range, it’s telling you to slow down a little and use fewer arm movements. Effectiveness. If your heart rate indicates you’re not working hard enough, then you can work out a little more vigorously to maximize the effectiveness of your workout. To maximize your aerobic workout, you need to stay in your working heart rate range for at least 20 to 30 minutes continuously. Incentive. By monitoring your heart rate from week to week as you participate in an aerobic activity, you'll discover that you will be able to exercise at a higher level of intensity, but at the same or lower heart rate. This is the way the heart tells you it is becoming stronger and more efficient. When you see positive results, it will motivate you to strive for even better results. The rate your heart is pumping when you have been sitting quietly for a while or when you are sleeping is your resting heart rate. This rate indicates your cardiovascular fitness level. The normal resting heart rate is 15 to 20 beats per minute slower than your “usual” heart rate. A person who is in good aerobic condition usually has a lower resting heart rate. Take your resting heart rate for 60 seconds before you get up in the morning. While you are exercising, you want to elevate your heart rate to produce a “training effect” but not so high as to be dangerous. Therefore, it is important to monitor your heart rate throughout the class. Gradually increase your working heart rate into a range that is maintained for the 20 to 30 minutes required to assure a training effect and an adequate workout. When you exercise, your heart rate quickens and you start breathing harder, in order to shuttle more oxygen to your cells. When you're in better physical shape, your heart typically recovers from that rapid heart beat quite quickly, and goes back to your normal or "resting" heart rate within a matter of minutes. When you're in poorer physical condition, your heart typically takes longer to recover. In order to determine your recovery heart rate, you'll first need to determine your resting heart rate so you can establish a baseline of what's normal for you. An easy way to test recovery heart rate in class is by doing the 20 Meter pacer test. Students will see what their peak heart rate is when they can no longer complete another sprint, follow this by having the student breathe and rest for one-minute to see what the heart rate is at. Then have the student subtract the peak HR by the one minute recovery HR to see what a students' recovery HR is. What Does SMART PE Look Like In Our School? I chose students 3-4 students from my three focus classes in my action research to participate in an anonymous google form that asked students brief questions regarding their experiences while using the heart rate monitors. I feel like it is easy for me as a teacher to assume the physical education environment has improved since implementing the heart rate monitors, but the real way to tell is to get the truth from the ones it affects most, the students. Here is the feedback I received from 16 students..
"I enjoyed being able to track my workout, and see how hard I'm working my body, or how much harder I need to try. It really put a perspective of how my heart is affected, and how important it is to stay in shape." "I enjoy learning how well I do each day and to improve it the next"
"It was interesting to see what kind of activity got your heart moving and how hard you worked affect it." "I like that it shows us the zone where we can maximize our work out potential, so that we can exercise to the fullest, and gain the most muscle, and burn the most calories." "I like how I get to see how hard I'm working and my progress throughout the semester." "I enjoy making a competition out of the point system. I found out this year what my resting and max. heart rate are. I also have found out what is healthy for me." "That they show you how hard you work and shows you what your max hr is." "I have been more motivated to challenge myself since I can see the level my heart is at. Also, knowing that the teacher can see if I am working hard makes me try more since my grade depends on participation. In addition to my grade, I find it interesting to compare my rate level with my fellow classmates." "I've enjoyed the heart rate monitors and seeing my progress. I learned about the heart rate and your peak." "I have learned both my resting heart rate and my max heart rate. 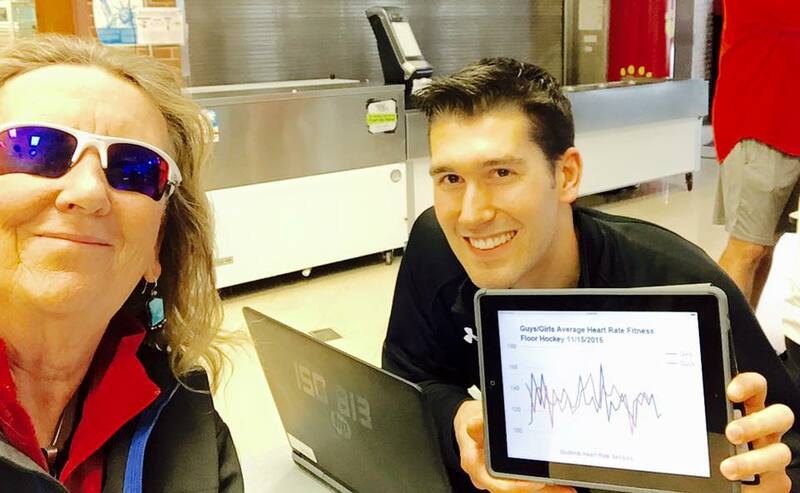 I enjoy the heart rate monitors because I feel they motivate us to do our best, not just because of the grade but because you want to get to the red and max your heart rate." "I like being able to see my heart rate, and knowing when I'm working hard." "They have points earned and we sometimes have a competition to see how can get the most points and it's always fun because you are doing it with your friends." I have learned a lot more about what the heart does, especially when being active. It is interesting to see how many "points" we get and how many calories we burn each day. I also really enjoy the emails we get every day giving us feedback. 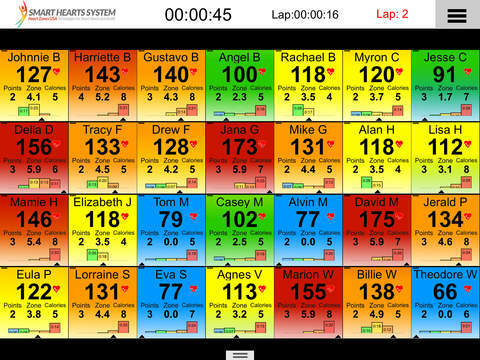 This feedback includes: peak heart rate, resting heart rate, how long you were in each 'zone', etc. It is so cool!" "I have learned that you have to work really hard if you want to be in the red and to stay in the red. I have enjoyed having the heart rate monitors, because I feel like they make me want to work hard in physical education with your heart rate being tracked. Whenever we do the warm up I try to raise my heart rate everytime I go by the heart rate tracker. It motivates me to get a higher heart rate everytime I see what it is. I have to pick up my pace everytime so I can get an even higher heart rate. I'm very thankful that our school is one of the first schools to use heart rate monitors. They really motive me and I wish I would've been able to use them in 7-9th grade years. I hope physical education students are more motived in physical education by the heart rate monitors like I've been this school year." ​"The armbands don't always stay on, maybe improve them." "The straps can come loose, or the Velcro can fall off completely. I wish there was a way to be able to keep it on tighter, and better. Other than that, they are a excellent classroom tool, and a privilege to use." "I would not change anything." "Not at all. I think this is a great program! I am glad I got to start it when I did!" "I didn't like that people could tell what my heart rate was around by the color of the wristband. Sometimes it made me feel out of shape." "I just do not like how sweaty the bands get. I understand since I am in one of the last hours that the condition of the bands is inevitable.... But it is still gross. I think that the school should supply the bands to kids so we don't have to spend five dollars on a piece of fabric that I can only use this year in this class, since I don't have a personal heart rate monitor to attach it to when I am done in P.E. Or at least borrow out bands that have to be returned at the end of the semester." "I feel like they aren't accurate the email sends different results than the thing in the gym. I would really like to find my resting heart rate every morning. This way, I could see how my stress levels, eating/drinking habits, and sleep patterns affect my heart. So, maybe do a log every morning to document these things over the course of the semester." "Sometimes the heart rate monitors will fall off during exercise." "No, I wouldn't change anything about the heart rate monitors. I think they're fun to use and learn with!" "There isn't much that I would change, but if I would change one thing I would have a certain heart rate that everyone should get to. This would be set differently for each person depending on their fitness level. A person that isn't in very good shape should have to get to a heart rate that is higher than the person that is in shape. Sometimes it's every hard to get a really high heart rate even if you try your hardest when you are in shape. I think that everyone should try there hardest so that they should get the most out of physical education each and everyday." "No, there is not. The entire process is well thought out and simple to use. I find it very useful to be able to check my heart rate whenever I want." "No, I like using the heart monitors."